Choose your preferred language. We speak English and 5 other languages. The Ritz-Carlton Doha This is a Preferred property. It provides excellent service, great value and has brilliant reviews from Roomhopper guests. Sorry, we don't recognize that name. 2 Adults 1 Adult more..
Want to pay when you stay? Pick a price with the "PAY AT THE PROPERTY" label. Every thing was Amazing! ,, especially the receptionist Mr.Ramez ,, He was Helpful , he helped me after I made a mistake in the reservation. This property is a 6-minute walk from the beach. Nestled on the shores of the Arabian Sea, the Ritz-Carlton resort boasts a world-class spa, modern fitness centre and eight elegant restaurants and bars. The property also features indoor and outdoor swimming pools and lush landscaped gardens. The scenic views from the guest rooms take in Qatar peninsula and Doha’s skyline. Each of the rooms and suites are elegantly appointed in a contemporary style and feature opulent fabrics and striking calligraphy pieces adorning the walls. The Lagoon restaurant, with its open kitchen, features a varied all-day buffet dining, combining Continental, Arabic and Far Eastern flavors. Porcini presents an authentic Italian cuisine. While the signature La Mer restaurant offers contemporary French dining, complemented by panoramic views of the Arabian Gulf from its 23rd floor location. The Ritz-Carlton Spa blends the elements of the sea and desert together to create a range of signature spa treatments. The hotel specializes in pairing ideal meeting venues with impeccable service and large MICE facilities with dedicated entrance and all facilities include break-out rooms located on the same floor on the lobby level. A dedicated Conference Concierge and professional meeting coordinators work tirelessly to ensure groups will be refreshed, inspired and energized by gathering here. The Ritz-Carlton is10 minutes’ drive from the cultural center of Doha, Katara Cultural Village and its conveniently located across Lagoona Mall. West Bay is a great choice for travelers interested in relaxation, beaches and family-friendly trips. This property is also rated for the best value in Doha! Guests are getting more for their money when compared to other properties in this city. When would you like to stay at The Ritz-Carlton Doha? Voyage to an exclusive island resort nestled on the shores of the sparkling blue waters. Grand, yet inviting, The Ritz-Carlton, Doha is an exceptional Qatar hotel that combines extravagant elegance with the warmth of a traditional Arabian welcome. The Ritz-Carlton, Doha takes special requests – add in the next step! All children under 16 years are charged QAR 100 per night for extra beds. Any additional older children or adults are charged QAR 100 per night for extra beds. Sign up and we'll send you special deals, offers and plenty of travel inspiration. 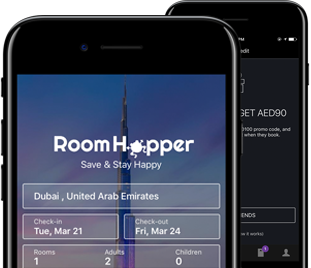 Get the FREE App to unlock up to 40% savings with Member Prices. Get the best deals for hotels fast! © 2019 RoomHopper.com. All rights reserved. You can add more rooms later, or for group bookings (9+ people) contact us.